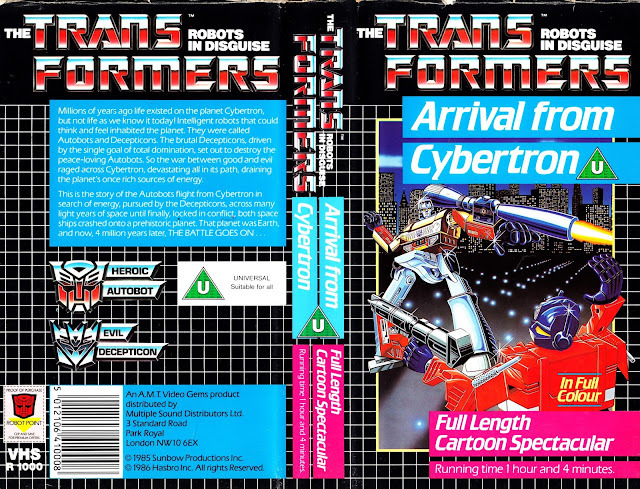 From the VHS era: the first TRANSFORMERS tape release in the UK, featuring the opening multi-part story ARRIVAL FROM CYBERTRON. AKA The Origin Story. The series made its TV debut sliced into brief four-to-five minute segments and aired daily, in the school holidays, as part of TV-am's weekday morning Roland Rat-fronted childrens strand. This strictly rationed approach ensured we tuned in every day of the holiday... and also allowed TV-am to make one 25-minute episode last a week. Which no doubt appealed to their frugal mindset. It also - of course - made a mess of the structure of the episode, not helped by some occasionally random fading in and out if the vision mixer wasn't paying attention. The breakfast broadcaster did - later - air complete episodes at the weekends. They also - briefly - pressed the show into service to fill their weekday schedules during the technicians strike which - initially - made it all-but-impossible for the management-operated station to mount anything other than the most simple (rip-and-read news headlines and the weather) live output. Numerous more TRANSFORMERS VHS tapes followed. When they proved a cashcow and a useful cross-promotion for the toys, Hasbro added tapes of pretty much every other animated show they were pumping out in the States. At least Transformers, unlike ACTION FORCE, didn't require a new soundtrack. The Transformers VHS UK releases quickly became pretty much the only way for most fans to watch episodes beyond the first season of the series - the only season TV-am bought the rights to. It's little wonder that Transformers episodes were regularly released on VHS until 1993. TV-am got a lot of mileage out of that first season of 16 episodes following the series' UK debut on 5th August 1985, with regular broadcasts continuing for the next couple of years. It's still quite odd in retrospect that TV-am never bought any further episodes of the series, particularly during the run up to the UK release of the 1986 animated movie, but then again TV-am had already started broadcasting Challenge of the GoBots only a couple of months after Transformers' UK television debut. TV-am bought the rights to more than just the first season of GoBots (unavoidable, since the first season consisted of only five episodes), therefore they were able to get more mileage out of that series instead, presumably on the basis that "transforming robot cartoons were all the same". How much is the vhs worth?